From the angle I was shooting this from it looked like she was going to run right into that tree. Believe it or not this is December 27th and the temperature on Long Island is sunny and 51 degrees Fahrenheit. When I reviewed this image on the computer I noticed there was an Opticians sign above her so I thought the title of the photo was appropriate. Fantastic Joe! A double bonus with the frames and the runner! Great shot. It also reminds me of the great Long Island novel, “The Great Gatsby,” which features an optician’s advertisement. Thank you very much Omar 🙂 I think you will enjoy it when you get it Omar, I really enjoy when I go out with mine. 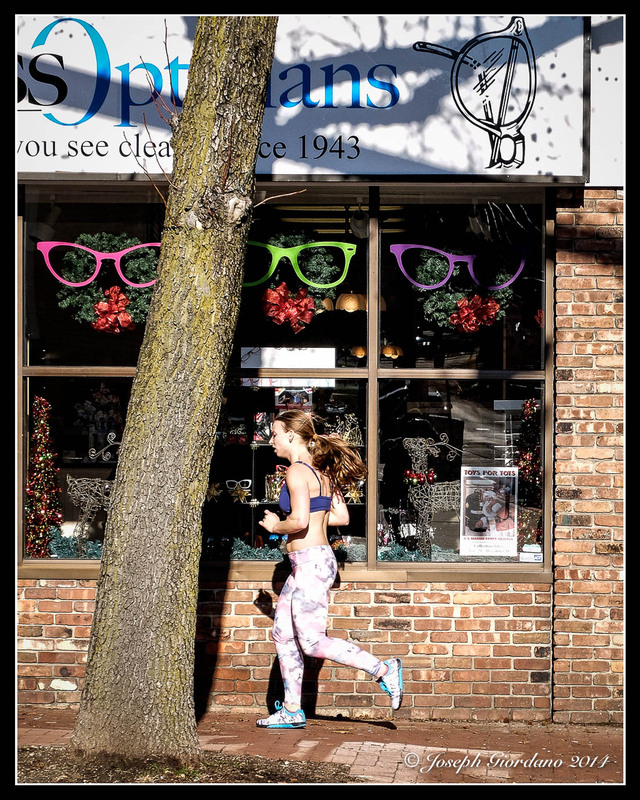 The large eye glass frames, in bright colors, made me think you were referring to the eyes watching the tree, not the girl running into it. There’s another interpretation for you! Great interpretation on the image Laurie 🙂 I really like Oneowner’s comment “what tree”, LOL. yes! That cracked me up! There is unusual weather Joseph, same thing here. We were close to 4°C (39°F) yesterday. I went at the shopping center today Joseph to look for the Sony A6000 and then I switched my mind when I realize the lack of lenses model available. I’ll soon have to send my T3 to Canon because censor have problems. If the problem is too expensive to repair I’ll have to choose for another camera and I’ll probably stay with Canon with all their available and cheap lenses. Have a great New year Joseph. So its warm up there also Meho, wow really freaky 🙂 That seems to be the main problem with Sony the lack of lenses. It was the same with Fuji but they have a considerable amount now. Carl Zeiss makes lenses for Sony and Fuji (they are called Touit) but they are really expensive. But then again to some people the images are worth the price. I’ll have to stick with the Fuji glass which is excellent but I only buy when they are offering instant rebates so I can get them a little cheaper. Enjoy the rest of your weekend.